On a recent road trip Barry made a couple of Farm Jeep related finds. The first was a planned visit to the Monroe County Historical Society Museum in Monroe, Michigan. Inside this excellent museum is an exhibit dedicated to the Monroe Automotive Equipment Company (MAECO). This is the company that made the Monroe hydraulic lift for farm jeeps and still makes Monroe shocks. The exhibit’s curator is retired MAECO engineer Jerry Wittkop. Jerry has assembled documents, photos, advertisement materials and samples of some of the many products made by this 100 year old company. Products ranging from the world famous shocks to golf balls. And of course, there is the Monroe hydraulic lift. In addition to a lift housing, the display includes a picture of the farm where jeeps equipped with the lift were tested and demonstrated. There is also a Monroe tractor seat on display. Jerry’s long career and personal involvement with the family that owned the company (until its sell to Tenneco Inc. in 1977) has resulted in a display that is informative beyond the normal corporate history. We had always wondered how Monroe ended up making hydraulic lifts for the jeep. As Jerry explained (and demonstrates through the exhibit), Monroe made products that could make use of their expertise in hydraulic systems. Some of that expertise came from the company’s work with World War II tanks and aircraft hydraulic systems. If you are in the Detroit area stop by and visit the museum and the MAECO exhibit. Barry and his wife Paula like to take interstate trip breaks by stopping at antique malls. Barry likes to search for jeep related items. Most of the time that means old magazine ads. The same trip to the Monroe museum found them stopping at a mall in a small town off the interstate. Barry quickly found a booth with a nice selection of automotive ads. 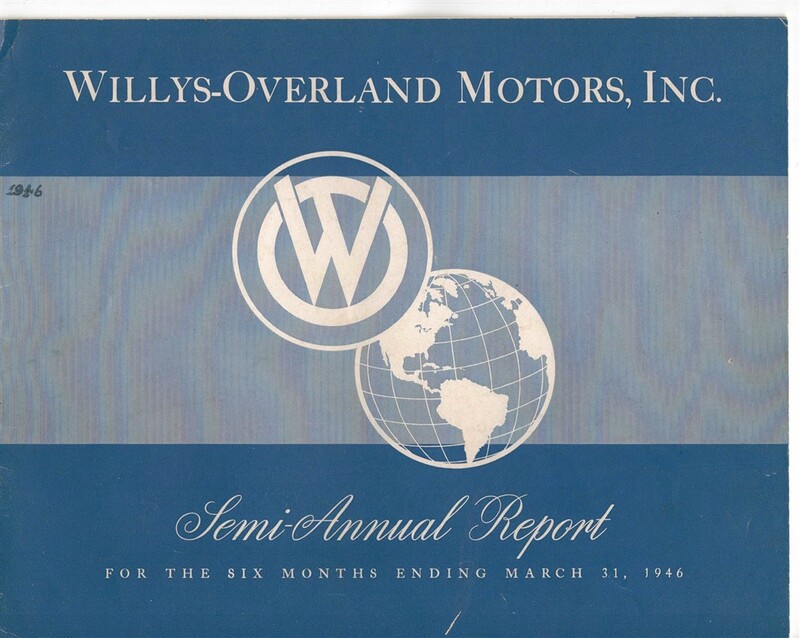 In among the ads was a Willys Overland financial report for the period ending March 31, 1946. We have posted selected pages of the report here. The most interesting parts of the report are in the narrative, including the fact that no jeeps were produced during the final 3 months of 1945 because of strikes at suppliers. 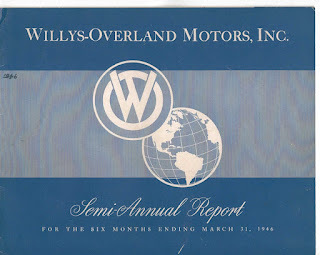 There is also the disclosure of the purchase of the Wilson Foundry & Machinery Co., the supplier of Willys engine blocks. The report also discusses the company’s design philosophy and introduces the lineup of the CJ2a, wagon, pickup and the “delivery sedan.” An interesting look into the early days of the CJ.